When I identified my top five values, it wasn’t straightforward to me how I would use money to further my value of marriage. Since Kyle and I don’t have kids yet, I figured every day hanging out at home was like a date, you know? Not really! There are many of non-everyday ways to invest in your marriage that money can make happen. It’s all about putting your money where your values are! Pretty standard suggestion! Go out with your spouse – spend time together – have fun. I would say a regular date night is must for parents, while DINKs can get by with sporadic dates. It’s important to leave the business of running a household behind on these dates and just focus on enjoying each other’s company. Kyle and I have tickets to our local theater about once per month during the school year. us at Niagara Falls. Kyle fails at smiling. From a night at a nearby bed and breakfast to multiple-week exotic vacations, it is wonderful to get away with your spouse. A trip can be just as rejuvenating for your relationship as it can be personally refreshing and relaxing. 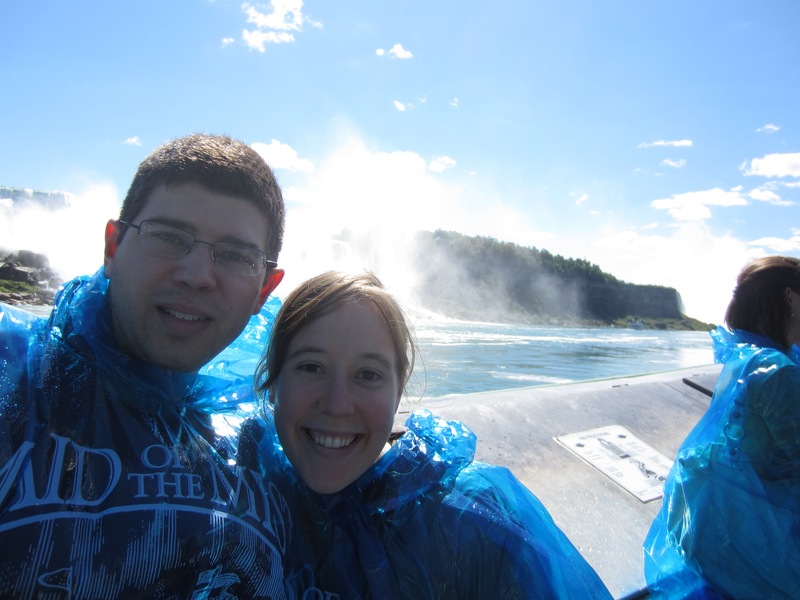 I admit Kyle and I haven’t taken a self-chosen trip just for the two of us since our honeymoon, but we tend to extend wedding-related travel to include some just-the-two-of-us activities, like when we went to Niagara falls a few months ago. Sometimes it takes getting outside your comfort zone to improve your relationship – and having someone push your to do that might come with a registration fee. Conferences can expose you to new ideas, topics, and exercises; you can learn from marriage experts as well as other couples. Kyle and I have been to one marriage conference hosted by our church. I love books, including self-help books; I love learning through reading. Reading through a marriage book together gives you space to discuss and absorb the concepts at your own pace. Kyle and I have read a couple books on Christian marriage together and found them very valuable for disabusing us of the notion that marriage is for our happiness. I prefer to buy this type of book even though I get most everything from the library so that we can be sure to finish them and use them for reference in the future. Investing in your marriage through counseling should happen before your marriage even begins – couples who undergo premarital counseling have about a 30% lower chance of divorcing than couples who don’t. I believe in prophylactic counseling – problems can be nipped in the bud – but the expense is prohibitive for us at this time. How does money help you invest in your marriage? Is there anything you would like to do that you feel you can’t afford right now? 32 Responses to "Ways to Monetarily Invest in Your Marriage"
Date nights is something that my wife and I need to do more of. It’s something small, but it seems to be easily pushed to the side in favor of “more important things”. Haha, we’re rarely doing anything more important time-wise on a Friday or Saturday night! We don’t like to spend money to go out just by ourselves (except for our theater dates) but dates don’t necessarily have to involve spending money. We could easily pack a lunch and go to a park together or take a stroll around our neighborhood. Interesting question. We don’t have kids but try to do a date night every week or two (or a visit every couple weekends when we’re long distance), and sometimes it *is* just sitting at home together, but it is still valuable during busy times because planning not to do anything else is the important part! Other than that, we tend to get each other gifts that are experiential and shared, like tickets to an event, a gift certificate to a brewery, a board game, or video games (which I thought we could play together since my husband loves them, but it turns out even when I pick them I don’t like them!). Your other ideas either are not available to us, or in the case of self-help books, would really, really not appeal to my husband…but I’m having trouble thinking of anything else beyond “spend time together!” In a more abstract sense, though, maybe frequently talking about your financial priorities and plans for the future is investing your marriage in a way – for example, if you’re working hard to pay for school, or plan for a dream trip, or save up for kids or a house, all of those are things you’re doing as a couple to shape your life together. I love the quality time spent with Kyle but that’s can definitely be free or cheap time. We went through a phase of playing some card games together nearly every day and that was very fun. I totally agree that talking about the future and allocating your money according to your values builds into your marriage. The date night/quality time should be a constant investment, but I think the others can come in occasionally if you’re looking for specific areas to improve in. Ha, we’re totally in a card game phase right now. Dominion! I’m not married, but I definitely think I need to listen to my boyfriend and let him take us out to dinner more often. Once a week seems reasonable. Dinners out are so nice without the stress of work or cleaning or anything (so long as I can actually forget about the cleaning I’m not doing…). I also try to make boundaries for where we’re allowed to have computers/phones and where it’s just us, which helps to improve communication. We’re going away for New Year’s, which will be our first trip away not to visit one family or the other, and I’m quite looking forward to that! December has been somewhat stressful, so it’ll be nice to get away for a few days. I like going out to dinner occasionally because I can order something that I can’t or wouldn’t bother to cook at home – it feels like even more of a treat because of those selections. That’s a great point about unplugging to spend time together – Kyle and I watch a lot of TV together while on our individual laptops but I definitely wouldn’t count that as quality time! Have a great time on your trip! What’s your destination? We’re going to a nice (hopefully!) bed and breakfast within a few hours’ drive. Great point – I should have thought to add that to the post. Outsourcing work to free up quality time is a perfect way to invest in your marriage. Great ideas! Date nights fall by the wayside all too often for us. Then you throw kids in the equation and it becomes even more difficult. We find that we have to be intentional about scheduling them or it simply does not happen. It’s a catch-22 that the time in your life when you need date nights the most is the one when they become most difficult to execute! You could even just get a babysitter to have a “date night” in your basement or somewhere away from your kids. I think these are all great. Afterall, what is more important that investing in your marriage?!?!?! We try to get a babysitter every other weekend so that we can have some time just for “us.” We have also just started planning a “kid-free” vacation every year, starting in 2013. My mom is going to watch the kids for a week while we go to the Caribbean in February. It is not cheap, but I believe that the alone time we will get will be a great investment in our marriage and in our young family. Holly@ClubThrifty recently posted..Enter Our iPad3 Giveaway!!! Kid-free vacation!! Woohoo!! Great job scheduling in those dates and vacation time for just the two of you. You are very smart to invest in your marriage before children because you each get shortchanged on time when you have a baby. If you aren’t secure in the marriage, this can be really hard. We probably don’t do enough of date type things because we work and feel guilty hiring a sitter when we are off, but we do try to get away at least once a year for a few days when Grandma comes to visit. Kid free trips are a must in my opinion. The main reason I’d like to be married for five years before having a child is so that we can build build build into our marriage before taking on that challenge! I know the first several years with very little ones can be rough and your marriage is sort of holding its breath underwater, unfortunately. Do what you can and this too shall pass, for good or ill.
Great ideas. Really, the key I think is in investing the time. Of course, how we spend that time also generally requires an investment of money too! One more thing – I think that pre-marital counseling can probably be really good idea for a lot of people, just to be sure they’re truly on the same page, and also have the capacity to choose compromise on some things. I don’t do it frequently, but I will bring home flowers every so often. She loves white roses. It’s not about spending the money, but about showing that she is on my mind. What a lovely gesture! Definitely counts as investing in your marriage. 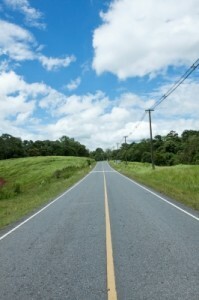 Savvy Scot recently posted..2012 – What a Freaking Year! That’s quite frequent – good for you! I thought I was going to be an angry single woman reading this, but I was wrong — you make solid suggestions! Thanks – now I’m curious as to what you expected! My wife and I have taken a yearly getaway to review our goals and plan new goals for the year. It has really helped us reconnect, recharge, and prepare for the upcoming year.